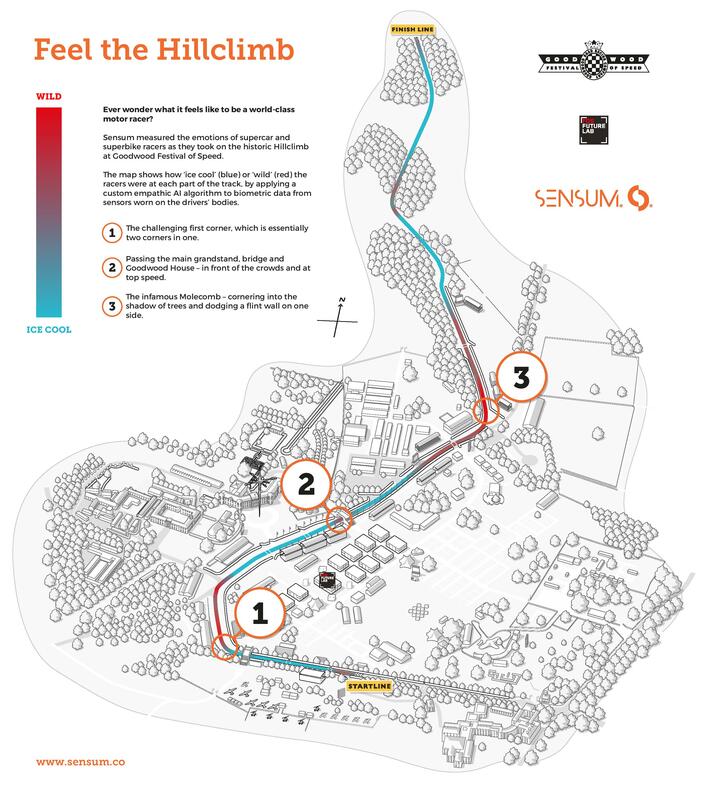 At this year’s Festival of Speed at Goodwood, England, Sensum achieved a world first by publicly displaying the real-time emotions of supercar and superbike racers in the festival’s historic Hillclimb challenge. Participants wore biometric sensors that provided data for Sensum’s ‘empathic AI’ algorithms to analyse live. Sensum then produced an on-going score of each racer’s emotional response to the track, ranging from ‘ice cool’ to ‘wild’. 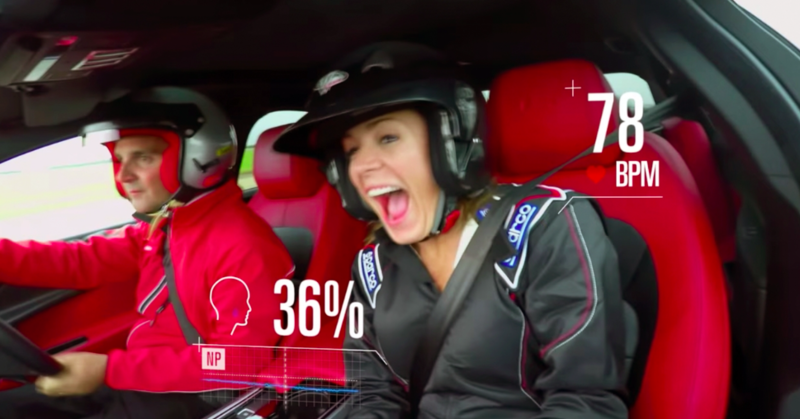 This kind of emotional measurement technology could be applied not just to future motorsport but also to the development of consumer vehicles. Another interesting finding was a strong correlation between high levels of ‘wild’ responses and low track times. In other words, the fastest racers were also the most excited or stressed, rather than the calmest. This could suggest that the faster people were performing in a heightened state of alertness, ‘on the edge’ where their performance is optimal. Gawain Morrisson, CEO & Co-Founder of Sensum said: “Sensum was challenged with connecting motorsport fans with the thrill of the Hillclimb. We demonstrated how current technology can be used to measure the real-time emotions and body data of vehicle occupants. Technology like Sensum’s could provide race teams with data to optimise both the health and performance of their racers. With moment-by-moment analysis of the vehicle occupant’s state, they could learn previously unseen insights such as which parts of the track are the most emotionally challenging, or when racers need to rest. In the consumer market, all the major automotive manufacturers are exploring how to integrate this kind of empathic technology into their vehicles. This could not only save lives, for instance by detecting driver fatigue or intoxication, but also improve the quality of the transport experience. Sensum was invited to Goodwood as part of Future Lab. Visitors were able to explore each racer’s emotional journey before, during and after their attempt at the Hillclimb, via an interactive touchscreen. The data for the screen was transmitted live from the sensors in the vehicles on the track nearby. For the biometric data, Sensum partnered with Equivital who have developed a military-grade chest strap which was worn by participating racers. Sensum also gathered data about the vehicles such as their speed and location. Sensum’s empathic AI technology interprets data from many sources, including body biometrics (such as heart rate), facial expressions and voice patterns, combined with contextual data from the surrounding environment, to produce a real-time understanding of the state of a human in almost any environment. The company considers itself world-leader at measuring emotions ‘in the wild’ – outside the lab, where people live their lives.